4th July saw the launch of Independents Day, a new annual initiative in the UK from the Association of Independent Music (AIM) to celebrate the importance and success of independently released music throughout the world — with album/event activity replicated globally under the umbrella of WIN, the Worldwide Independent Network) — and also to raise a bit of cash for charity. The double ID08 CD was only available in the shops for three days, although you can still get it online — and forgetting about the charitable inclinations there’s a few musical reasons why you might like to do so. 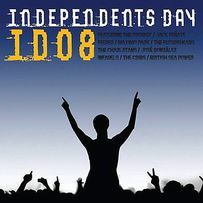 The second disc sees well-known indie acts’ recommendations of lesser-known, or more-indie acts, which, in the case of the several great songs like British Sea Power’s choice The Tenderfoot’s “People are the Problem”, may do the exact thing that the whole initiative has set out to do — and turn more people on to the acts that work on the fringes and through the little operations, yet have so much to offer.